Caja Laboral Vitoria fueled its Top 16 hopes with a 76-91 road win over Anadolu Efes on Friday night in Istanbul. The victory lifted Laboral to 3-6 and ensured that the fourth and final Top 16 ticket in Group C won’t be handed out until next week. Efes, which dropped to 5-4, already qualified to the next stage. Maciej Lampe shined early in leading Laboral to a 34-38 halftime lead and finished with 17 points and 7 rebounds. Last week’s buzzer-beating hero Thomas Heurtel tok over after that and amassed 22 points to lead the winners. Heurtel’s fourth quarter performance held off an Efes challenge and led Coach Zan Tabak’s team to back-to-back wins for the first time this season. 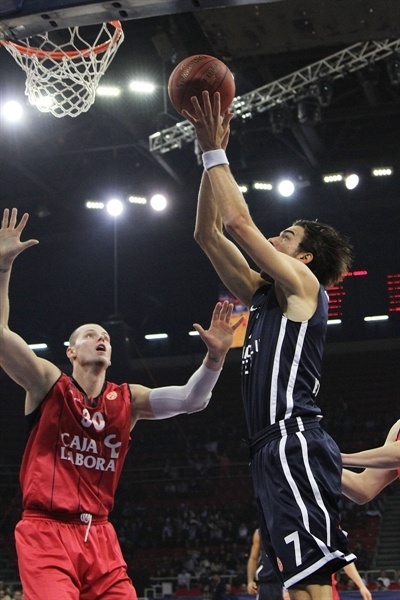 Sasha Vujacic paced Efes with 21 points and Semih Erden added 17 points and 7 rebounds in defeat. Lampe put down the opening points with a basket from the high post, as Efes struggled offensively. Lampe was on hand for rebounds and blocks, making his presence known inside the paint early on. Efes missed its first 8 shots, finally ending the drought just over three minutes into the quarter through a Vujacic's basket. A Dusko Savanovic layup took the score to 4-4. A dunk by Erden got the crowd going, and the atmosphere intensified when Vujacic hit the first triple of the night to take the score to 11-8. Vujacic hit another shot from outside just when Laboral had gone back in front. Sinan Guler made his contribution with 4 steals, including 2 in the space of 21 seconds that he converted into layups. Fabien Causeur's shot from beyond the perimeter in the final minute of the quarter snuck Caja Laboral ahead after 10 minutes, 19-21. Josh Shipp hit Efes's first shot of the second quarter from beyond the arc, but the visiting side knew how to handle the threat. Turnovers were conceded, but not converted into points, keeping the game close. 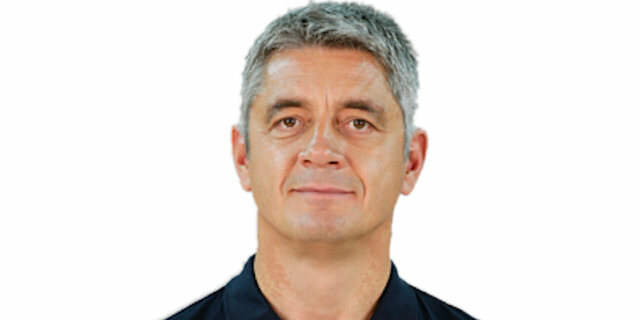 Shipp's two-pointer to beat the shot clock buzzer allowed Efes to make it 26-27, although Laboral always had an opportunity to re-establish the advantage. 26-33 was the largest gap between the two teams in the second quarter. There was some controversy centering at the end of the quarter surrounding Dusko Savanovic: The power forward hit a three-pointer, then stole the ball back and released another triple. However, he had done so after the buzzer and the points for the latter shot were waved off, leaving the halftime score at 34-38. A duel between Lampe and Erden ensued as they exchanged points on one another in the paint. Brad Oleson sank a triple for Laboral to keep it ahead, 39-45, as Efes struggled to find a consistent tempo and strategy to put up big points. Andres Nocioni was invited to sit out for a while with his fourth foul of the game, replaced by Fernando San Emeterio. Heurtel, created a 10-point lead for the visiting side with a three-pointer midway through the quarter, taking the score to 41-51. Vujacic and San Emeterio traded shots from beyond the arc, but the gap was always under Laboral’s control and aided by persistent trips to the foul line. Erden’s energetic dunk for Efes put the exclamation point on the quarter, but his team trailed 59-65 going into the final quarter. The Erden-Lampe matchup continued to provide the points at the start of the fourth quarter, whether from open play or the foul line. Lampe’s big rebound and put-back took the score to 62-71, and gave the Laboral center his sixth board. Heurtel hit two huge threes at the halfway mark in the quarter that put the visitor double digits ahead once again, showing his ability to step up when needed. Both teams had players in foul trouble, but tough defense was a must in a fourth quarter that always seemed to be on the brink of a turnaround. Nocioni took advantage with a drive inside that drew a foul, putting his side 72-86 on top with 1:30 left on the clock. Thomas Heurtel’s 10 points in the quarter proved to be the difference and his fourth triple of the game put the result beyond doubt. "The players who are called 'stars' - it's not me but the other people who called them stars - were not on the court mentally. They were only there physically. A week ago, we secured our place in the Top 16. But I think those stars were not here tonight, they were somewhere else! We knew how strong Caja Laboral was on the rebounds. We tried to balance it. But unfortunately it was a totally terrible team performance. Nobody challenged them." "We are very happy to have won in a difficult place against a very strong team like Anadolu Efes. We will keep on digging for the Top 16 until the last minute. I believe in my team that we can make it. My technical stuff and I will try to help the team to reach this achievement."